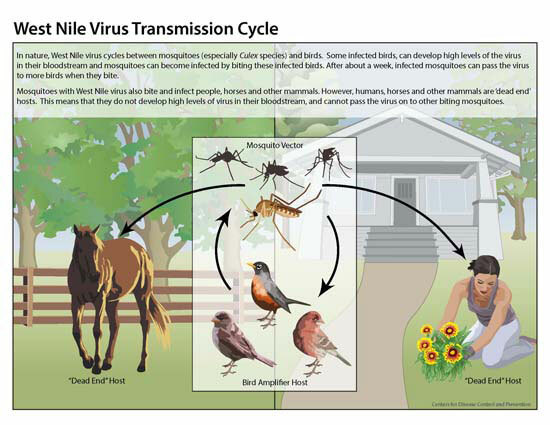 IDPH information on West Nile transmission. 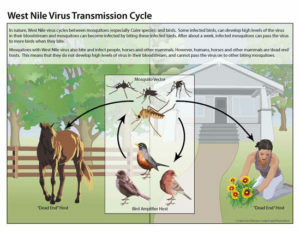 The first death of the year from the West Nile virus has been confirmed in the state. “It was in an elderly person from central Iowa. And this is always tragic. We do have West Nile deaths almost every year in our state,” according to Iowa Department of Public Health deputy epidemiologist, Ann Garvey. Two people died from West Nile last year. Doctor Garvey says they have one other confirmed case of West Nile, and that man has recovered. She says there could be more cases confirmed as we move toward fall. “We just want to remember everyone that this is the peak time — we tend to see West Nile activity increase in the August, September time frame — so it’s even more important to make sure that you are using insect repellent when you are outdoors. Especially during those peak mosquitoes hours from dusk until dawn,” according to Garvey. People who are more than 60 years old are at the greatest risk for West Nile. People with medical conditions such as cancer, diabetes, hypertension, kidney disease, and people who have received organ transplants, are also at greater risk for serious illness. “About 80% of people who are infected with this virus won’t have symptoms. But we know that of the 20% that do — about one in 150 could have life-threatening complications,” Garvey says. Garvey says you can easily prevent West Nile by using insect repellents. She says there are number of repellents that are approved by the EPA and they recommend that you use one. Garvey says repellents with DEET are effective, and they also provide you protection against ticks, which are still active. You can help prevent mosquitoes from taking over your yard by eliminating standing water where mosquitoes lay eggs. Empty water from buckets, cans, pool covers and pet water dishes. Change water in bird baths every three to four days.